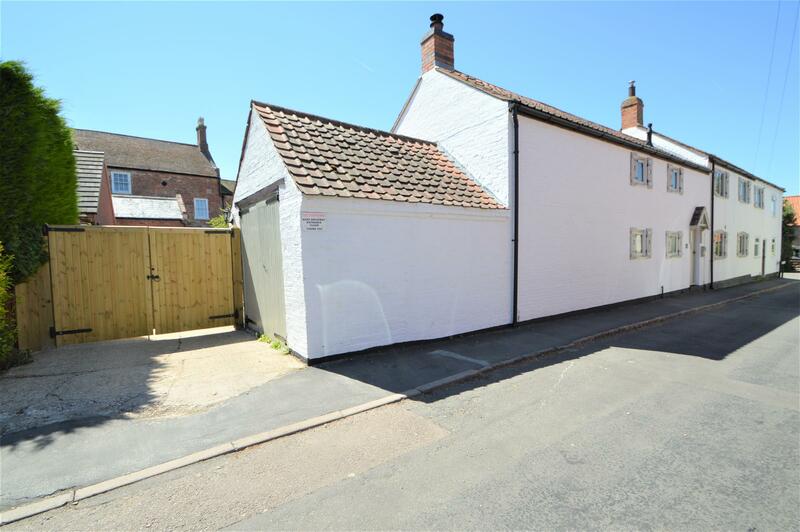 Benjamins are pleased to bring to the market this interesting and bespoke character cottage, situated right at the heart of the much sought after and highly regarded village of Long Clawson. This individual home has been considerably renovated by the current owners to create deceptive accommodation which lies in the region of 1800 sq ft. The property offers a wealth of charm and character with exposed beams and brickwork and attractive open fireplace to the living room. The property is situated on a manageable plot with gated access leading on to a large driveway and a detached timber garage and brick workshop. The inside of the property briefly comprises of entrance hall, cloakroom, utility, sitting room, dining room, kitchen, conservatory and from the first floor central landing master bedroom with En Suite. From the inner landing via the newly built 2nd staircase you can access the family showeroom, bedroom 2, 3 and 4. The rear garden is mainly laid to lawn with well stocked borders with established trees and shrubs, pleasant decked area to the foot of the garden with timber pergola over. The property is within walking distance of local amenities. Long Clawson is a well serviced and popular village located within the heart of the Vale of Belvoir which is within easy travelling distance of the nearby towns of Melton Mowbray, Bingham and Grantham as well as the cities of Nottingham, Leicester and Loughborough. The village has a gastro pub, delicatessen, primary school, doctors surgery, village hall and shop, offering a good community spirit with many social activities being arranged throughout the year. Viewing comes highly recommended to appreciate the wealth of character accommodation on offer. Having tiled floor, central heating radiator, wall light point, attractive exposed beam, turning staircase rising to the first floor, wall mounted electrical consumer unit concealed behind pine cupboard, UPVC woodgrain effect obscure glazed window to the front elevation. Having a two piece white suite comprising close coupled wc, wall mounted wash basin with chrome taps, continuation of the tiled floor, inset downlighters to the ceiling. A good sized room which offers a wealth of character and features with beamed ceiling, the main feature being an attractive exposed brick fireplace with oak mantle, inset open grate and brick hearth, carpet, wall light points, central heating radiator, UPVC woodgrain effect double glazed windows to both the front and rear elevations and French doors leading to the rear garden. Another reception room containing a wealth of character with exposed brick chimney breast with timber lintel and quarry tiled hearth, beamed ceiling, wood effect flooring, wall and ceiling light point, telephone point, UPVC obscure woodgrain effect double glazed windows to both the front and rear elevations. An open doorway leads through to the Kitchen. A modern but cottage style range of wall base and drawer units, butchers block effect laminate work surfaces with inset one and half bowl sink and drainer unit with swan neck mixer tap, ceramic tiled splashbacks. Integrated appliances include four ring Siemens electric hob with concealed hood over, Neff stainless steel finish double oven, beamed ceiling with inset downlights, tiled floor, central heating radiator, UPVC double glazed woodgrain effect windows to both the front and rear elevations, staircase leading to the inner landing and a timber multi-pane door gives access through to the conservatory. Having plumbing for washing machine and space for tumble drier, rolled edge laminate work surface with inset stainless steel sink and drainer unit with chrome taps and ceramic tiled splashbacks, tiled floor, central heating radiator, inset downlighters to the ceiling. The main conservatory offers a tiled floor, pitched double skin polycarbonate roof, UPVC woodgrain effect double glazed panels and French doors on to the rear terrace with the remainder providing a tiled corridor leading back to the kitchen. Being L shaped and having part pitched ceiling with inset downlighters, central heating radiator, ceiling light point, UPVC obscure double glazed woodgrain effect window to the front elevation, a cupboard also houses the boiler which is only 2 years old and cottage latch ledge and brace doors lead to the Master Bedroom. Walk in style wardrobes, part pitched ceiling, two windows to the rear elevation overlooking the garden, carpet, two central heating radiators, wall light point and UPVC woodgrain effect window to both the front elevation. Refitted with a four piece contemporary white suite comprising large bath tub with chrome mixer tap, wall mounted Aqualisa shower rose over and curved glass screen, close coupled wc, pedestal wash hand basin with chrome mixer tap, ceramic tiled splashbacks, wood effect tiled floor, inset downlighters to the ceiling, wall mounted chrome heated towel radiator, large velux skylight to the rear elevation. 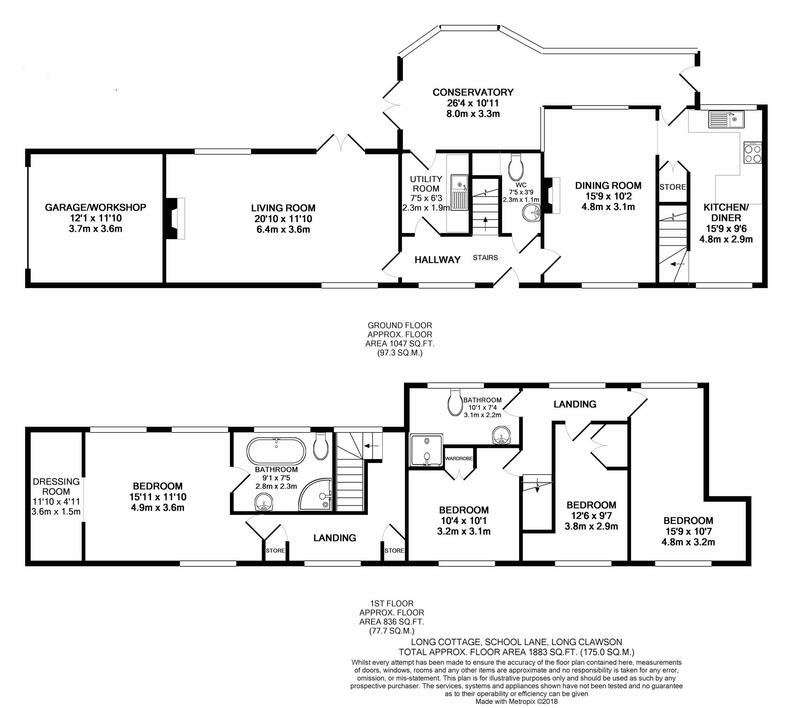 With ceiling light point, central heating radiator and UPVC double glazed woodgrain effect window to the rear elevation and further cottage latch ledge and brace doors leading to the remaining three bedrooms and family bathroom. This room has two ceiling light points, central heating radiator and UPVC double glazed woodgrain effect windows to the front elevation. Central heating radiator and UPVC double glazed woodgrain effect windows to the front elevation. An L shaped room having central heating radiator, ceiling light point, chimney breast, built in wardrobe and UPVC woodgrain effect double glazed window to both the front and rear elevations. With shower cubicle, ceramic tile splashback, rainfall shower head, wood effect tiled floor, low flush WC, wash hand basin with mixer tap and under storage cupboard, chrome towel radiator and UPVC double glazed window to the rear elevation. To the front of the property are newly fitted shutters to each of the windows and there is gated access leading on to a large driveway which provides off road car standing for several vehicles as well as a detached Brick Garage / Workshop and Timber Garage. The Rear Garden is adjacent to the driveway and screened by trellising and plants. There is a paved terrace ideal for entertaining and barbecues as well as a lawned area with trees and shrubs with a further timber decking area with pergola. With timber door, pitched roof, power and lighting. With double doors, power and light. There is an adjacent log store.